Mohamed Salah is threatening to set Liverpool’s highest individual goal tally since Luis Suarez’s prolific 2013/2014 season. 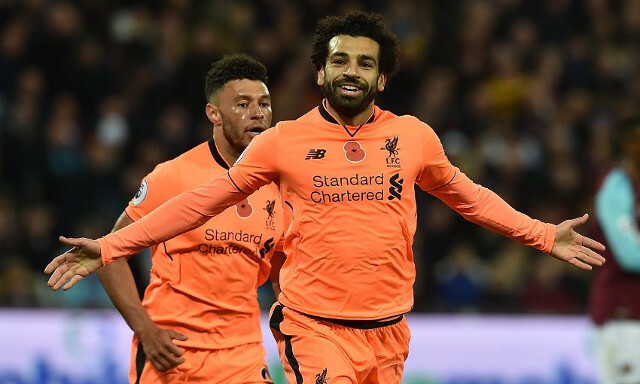 The Egyptian scored twice as he starred in Saturday evening’s 4-1 demolition of West Ham at the London Stadium, helping the Reds make is 10 goals across three consecutive wins. Reunited with the returning Sadio Mane, Salah was in devastating counterattacking form and proved an unrelenting menace to Slaven Bilic’s side. The summer signing has now scored 12 goals in 17 games for the Reds, meaning he is only two away from Philippe Coutinho’s tally of 14 in the 2016/2017 campaign. Moving beyond 14 goals would mark the highest individual scoring record across all competitions in a season since Suarez’s 31 when Liverpool finished second in the the league behind Manchester City. At this rate, Salah could even threaten the Uruguayan’s total given his emphatic start to life on Merseyside. It’s also worth noting the number of golden opportunities the former Roma man has squandered in recent weeks, including a penalty miss during the 3-0 win over Huddersfield. In a mixed few months for the club, Salah has remained a glaring positive and will soon have the added benefit of Philippe Coutinho and Adam Lallana returning to action. Saturday’s triumph served as a welcomed reminder of how potent an attacking force consisting of both Salah and Mane is. This team may continue to ship goals, but it will also continue to score plenty.